Spring Commencement is May 4, 2019. Use the order form link below to purchase your regalia. You may also use the link to reserve commencement tickets. * Once your order is placed, you will receive a confirmation email. If you have any questions, please email capandgown@mtu.edu. *Deadline to reserve tickets is Wednesday, March 20th at 12:00pm. Each graduate may reserve a maximum of 3 tickets for the ceremony in the Ice Arena. A maximum of 6 additional tickets may be reserved for the overflow area located in the Varsity/Wood Gym where commencement will be streaming live on a big screen. For ticket inquiries, please contact the Central Ticket Office in the SDC at 906-487-2073. If available, extra tickets may be reserved online, in person at the Central Ticket Office in the SDC or by calling 906-487-2073 starting on Monday, April 1st at 8:00am. Any extra tickets will be available on a first come, first served basis while supplies last and must be reserved by 12:00pm on Thursday, April 4th. All sets include a gown, SureFit cap (one size fits most) and tassel. Masters and PhD sets also include a hood. Masters and PhD students may not wear Undergraduate garb. Prices subject to change. There are no refunds on cap and gown orders. You will be wearing "green" gowns - not in color, but in spirit! They will be black, as usual, and made of Renew fabric manufactured from Repreve, 100% recycled fibers. Every Renew graduation gown uses approximately 27 plastic bottles. 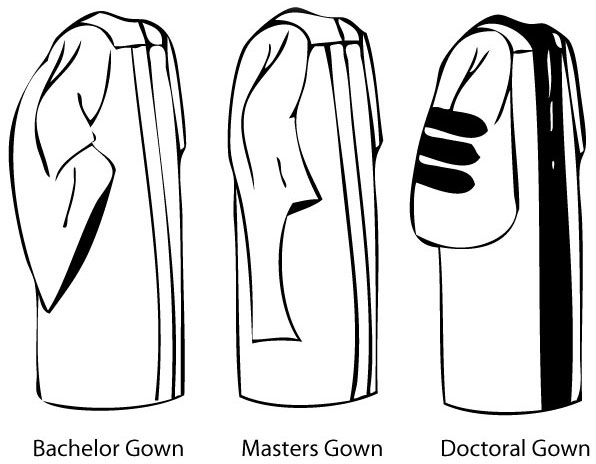 Each degree has a different style gown. Masters and PhD students may not wear Undergraduate garb. See the graphic below for an example of how your gown should look.